pebble beaches and 150 m from the town center. 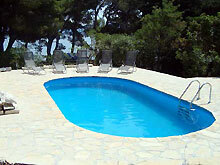 • Villa is a suitable accommodation for 8 - 10 people. ground floor and the first floor. 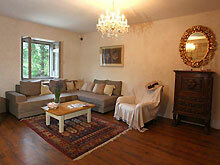 nicely decorated and fully equipped kitchen with dining section. islands in the distance. On this floor there is also additional bathroom too. • Villa has a beautiful terrace on the top floor that offers a unique view. reserved parking spaces for its guests.